Last week we continued our look at Centrality algorithms, with a focus on the Degree Centrality algorithm, which measures the number of relationships a node has. 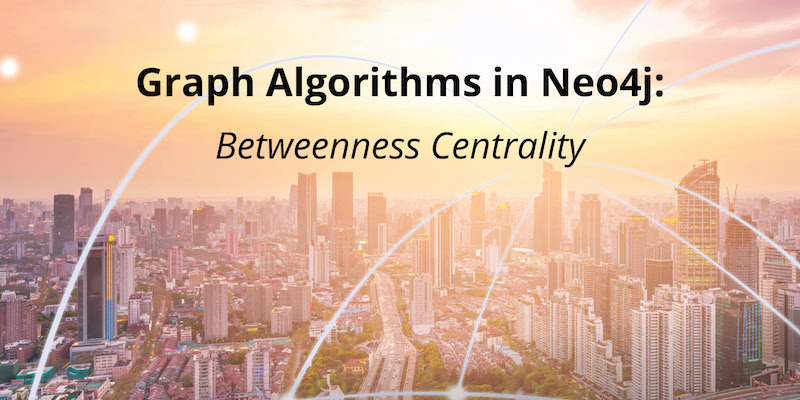 This week we’ll look again at Centrality algorithms, picking up with Betweenness Centrality, which measures the number of shortest paths that pass through a node. Nodes that most frequently lie on shortest paths have higher betweenness centrality scores and are the bridges between different clusters. 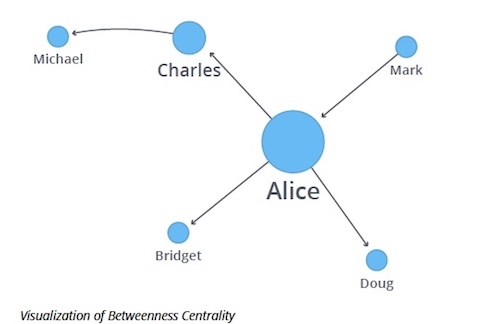 Betweenness Centrality is a way of detecting the amount of influence a node has over the flow of information in a graph. It is often used to find nodes that serve as a bridge from one part of a graph to another. 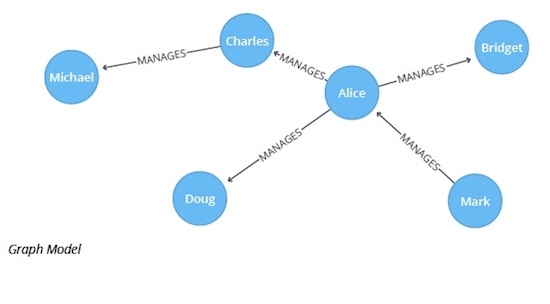 In the following example, Alice is the main connection in the graph. 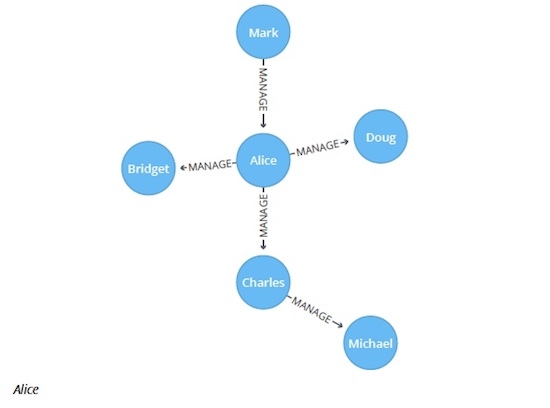 If Alice is removed, all connections in the graph would be cut off. This makes Alice important, because she ensures that no nodes are isolated. The Betweenness Centrality algorithm calculates the shortest (weighted) path between every pair of nodes in a connected graph, using the breadth-first search algorithm. Each node receives a score, based on the number of these shortest paths that pass through the node. Nodes that most frequently lie on these shortest paths will have a higher betweenness centrality score. The algorithm was given its first formal definition by Linton Freeman in his 1971 paper, “A Set of Measures of Centrality Based on Betweenness.” It was considered to be one of the three distinct intuitive conceptions of centrality. 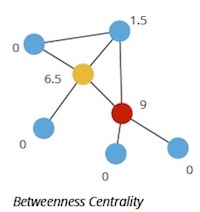 When Should I Use Betweenness Centrality? Betweenness Centrality is used to identify influencers in legitimate or criminal organizations. 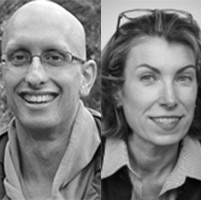 Studies show that influencers in organizations are not necessarily in management positions, but instead are found in brokerage positions of the organizational network. Removal of such influencers could seriously destabilize the organization. More details are found in “Brokerage qualifications in ringing operations” by Carlo Morselli and Julie Roy. Betweenness Centrality makes the assumption that all communication between nodes happens along the shortest path and with the same frequency, which isn’t always the case in real life. Therefore, it doesn’t give us a perfect view of the most influential nodes in a graph, but rather a good representation. Newman explains this in more detail on page 186 of Networks: An Introduction. For large graphs, exact centrality computation isn’t practical. The fastest known algorithm for exactly computing betweenness of all the nodes requires at least O(nm) time for unweighted graphs, where n is the number of nodes and m is the number of relationships. Instead, we use an approximation algorithm that works with a subset of nodes. Let’s see how Betweenness Centrality works on a small dataset. The following Cypher statement creates an organizational hierarchy. The following query executes the Betweenness Centrality algorithm. As mentioned above, calculating the exact betweenness centrality on large graphs can be very time-consuming. Therefore, you might choose to use an approximation algorithm that runs much quicker and still provides useful information. Nodes are selected uniformly, at random, with a defined probability of selection. The default probability is log10(N) / e^2. If the probability is 1, then the algorithm works the same way as the normal Betweenness Centrality algorithm, where all nodes are loaded. First, the mean degree of the nodes is calculated, and then only the nodes whose degree is higher than the mean are visited (i.e., only dense nodes are visited). As a further optimization, you limit the depth used by the Shortest Path algorithm. Let’s see how Approximation of Betweenness Centrality works on the same dataset that we used for the Betweenness Centrality algorithm. The following query executes the Approximation of Betweenness Centrality algorithm. 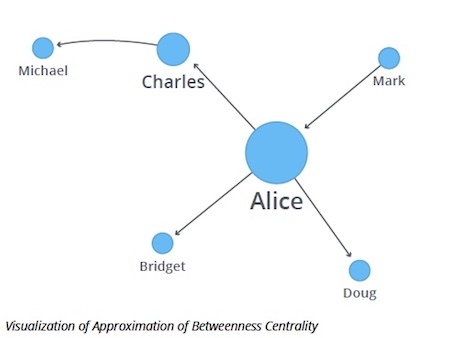 Alice is still the main broker in the network, and Charles is a minor broker, although their centrality score has dropped as the algorithm only considers relationships at a depth of 1. The others don’t have any influence, because all the shortest paths between pairs of people go via Alice or Charles. As we showed in our look at the Betweenness Centrality algorithm, Betweenness Centrality applies to a wide range of problems in network science and pinpoints bottlenecks or vulnerabilities in communication and transportation networks. Next week we’ll continue our look at Centrality algorithms, with a focus on the Closeness Centrality algorithm. Nice work, but I need to add something. Yes, betweenness centrality algorithm calculates the shortest weighted paths, but the procedures in “algo.betweenness” assume that the graph is unweighted. Calculates the betweenness centralities as if all edges are 1. If you want to make sure, take a look at the link below. It clearly says that “Implements Betweenness Centrality for unweighted graphs” in the comments.